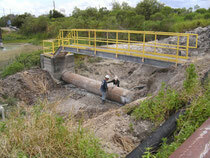 Pipe Wrap - Premier Corrosion Protection Services, Inc. Active Leak Repair to 30" and 24"Carbon Steel Pipe - Stop active leaks and wrap over 700 LF of 30" and 24" carbon steel pipe while the line was active using FRP composite material. 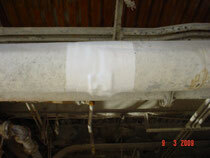 In some cases, the pipe was so severely corroded that all prep. had to be done by hand. 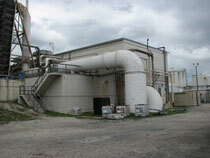 Dry Acid Scrubber - Repair and strengthen a scrubber vacuum line using FRP composite material while line was active. Underground Pipe Repair - The existing corrugated steel pipe was severely corroded. The method of repair was to fabricate an FRP "jacket" and install it over the existing pipe flaring the FRP material over the concrete drainage structure to ensure a leak free connection. Active Stem Repair - Repair of an active leak a at a carbon steel spool using FRP composite mateerial. 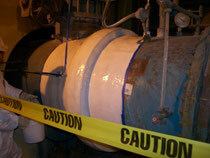 Cooling Tower Return Pipe Repair - Wrapping 48" and 54" diameter corroded steel pipes with FRP composite materials. Active Leak Repair - Stop leaks and wrap a steel pipe various loations while the line was active using FRP composite material. 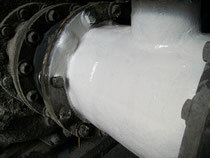 Flange Encapsulation - Encapsulate a leaking 48" diamter flange with FRP composite material. 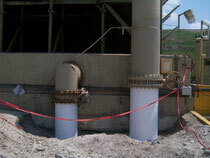 Active Valve Stem Leak Repair - Repair of an active leat a at a carbon steel spool using FRP composite material. 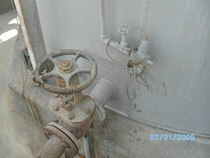 Active Coke Gas Valve Repair - Stop active leak in the valve casing at a coke gas valve with FRP composite materials. Cooling Tower Pipe Repair - Below grade carbon steel pipe that had suffered severe corrosion was repaired using FRP composite material.